Stinky Snake, a 2D-platformer to be released for PC on Steam June 26, 2018. After being shipwrecked, a snake named Snake, a human child named Puppy, and a Great Pyrenees dog named Angel are harassed by a pack of skunks. Their leader Skunk captures Puppy and Angel, spending the rest of the game taunting and trying to capture Snake. The game is set on a tropical island with palm trees and an active volcano. The player’s goal is to defeat and eliminate all of Skunk’s followers that are in each level. They must also navigate through all the obstacles generated on each level throughout the game until the end. Some of these obstacles can be used to trap the skunks rather than kill them. In the final level, their goal will be to battle Skunk and his followers to get his family back. – Act 1: Snake will be trying to get up a hill and eliminate or trap all skunks. 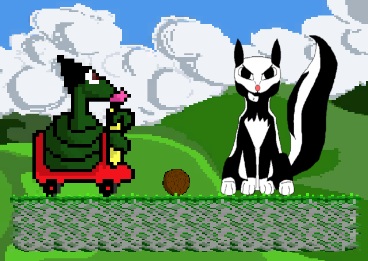 Skunk will be racing away with Snake’s family members. – Act 2: Snake will be closer to the volcano and at the end of this act, he will fight Skunk. Skunk will escape this time. 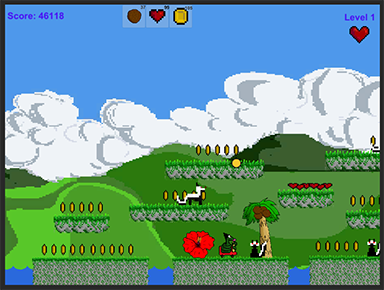 – Act 3: Snake battles or traps stronger skunks until getting to the volcano’s ridge. There, the remaining skunks will either be eliminated or trapped by Snake. When Skunk is defeated the game ends. – Snake: The snake that is shipwrecked with Puppy and Angel. This is the character that the Player will be in the game. – Skunk: The Boss that Snake battles in Level 12 and 17. Makes a brief appearance in Level 6. – Puppy: The human child that is shipwrecked with Snake and Angel. – Angel: The Great Pyrenees dog that is shipwrecked with Snake and Puppy. – Alana: The witch that Snake encounters in Act 2. – Skunk’s followers: A collection of smaller skunks.